As far as my skiing life goes, the Aspen Highlands Bowl in Colorado is as intense as it comes. Following a couple of chairlift rides to the top of the mountain, I hiked for almost an hour with my skis on my shoulder to the top of the Bowl. It was fun and tiring, just for one run. As it turned out, skiing was the easy part. And that’s saying a lot considering it was the toughest terrain in the area, and Colorado for that matter. The Bowl. That’s what everyone calls it. Located at the top of Aspen Highlands Mountain, The Bowl faces Aspen Mountain. It’s steep enough to attract Warren Miller. Skiers have been making the trek up The Bowl since it opened to the public in 1997. On an Aspen Highlands extreme skiing guide, it says, “The Bowl is truly for experts only who desire an ‘in-bounds’ backcountry experience. PLEASE give this area the respect it deserves and ski and snowboard with caution at all times.” With all that said, and being an intermediate skier, I naturally had to do The Bowl at least once this season. And what better day than in late March after a good snowfall the night before? Get plenty of sleep. Besides being in good shape or an expert skier, sleep is the only other component for success on The Bowl. Or so I found out a few hours after I woke up at eight. Unfortunately, I hadn’t been skiing much or exercising. March Madness was consuming my time and thoughts when I wasn’t working at the Hotel Jerome. So I was not in good shape, but I figured youth and athleticism would compensate for lack of preparation. But it’s even harder to compensate for a good night’s rest. I worked until a quarter after midnight and didn’t go to sleep until a quarter after one. When I woke up the next day, I felt good for some reason. Maybe it was adrenaline and the thought of finally facing The Bowl. I knew there weren’t too many more powder days left. So I ate a ham sandwich, it was all I had in my fridge, and I walked to RubymPark, the bus station in Aspen. Above, the sun peaked in between a cloudy sky. As the bus drove down Maroon Creek Road, anxiety spread throughout my body. At the same time I was excited, too. I rode two chairlifts up to the top of the mountain. I saw a wooden sign, which read, “THE BOWL, CLOSED.” I expected that due to a fresh layer of powder, it wouldn’t be open early in the morning. As I looked into the distance at The Bowl I saw snow eject in two spots near the top of The Bowl. A second later I heard a pair of “booms.” The ski patrol was setting dynamite in certain areas of The Bowl to prevent an avalanche. I decided to take a few runs. The powder was great and so was the weather, partly cloudy and sunny at times. After taking three runs I waited in a short line at the Lodge chairlift. There were more people now in line. That was a good sign, I thought. Sure enough, I looked at a bulletin board next to the lift attendants, which read, “The bowl is open.” I felt relieved, but I was still a bit apprehensive. I sat on the right side of the chair. Next to me, a man asked the two women sitting next to him if they were going to ski The Bowl. They said no. He said they should because of the good conditions. I noticed the man had a Camel Pak filled with water and he sipped it as we rode higher. His skis were much wider than mine and I knew I’d be one of the least prepared people to do The Bowl. But there was no turning back. I got off the chairlift and skied down a little way to the Ski Patrol office building. I walked up the medal stairs and onto the patio. I looked out and saw people walking up The Bowl’s crest. It looked like something you would see in a magazine. Grayish clouds surrounded The Bowl. I peed in the restroom and then walked down, put on my skis and skied down a short slope. To my left there was a large group of people. They looked like sightseers, staring at the steep white slopes and jagged peaks. They were waiting for the snowcat, which drives skiers about a fifth of the way up. The line was too long so I walked. “I need to rest for a little while,” said the other man. I decided that the first man had a point and started up the narrow and crest. I followed another skier and walked in the only set of footprints I saw. To my left and right were steep slopes of untouched powder. It was hard to look up and enjoy the scenery because the footing was in a very narrow path. I felt the altitude, taking in deep breaths and concentrating on each step. I took a short rest and the people from the snowcat caught up to me. I continued hiking up with a large group of hikers behind. At one point, because of tough footing and exhaustion, I fell to my right and clung to the area of the footprints. Instead of helping me, a few hikers pushed ahead without even a nod or any acknowledgment of my predicament. A man in his twenties or early thirties saw me struggling and waited for me to climb back up and regain a spot in the single-file line. During the entire time hiking, I never heard anyone say a word. It was too difficult a hike to talk. The wind blew at times, but it felt good because I was perspiring even though I only wore a T-shirt under my ski jacket and ski pants. I continued the ascent and fell in an area where it became less narrow. After resting a minute or so, I saw a girl, about my age, hiking past me with a look of anguish on her face. It was the steepest part of the climb, the final ridge before hikers headed left to the top of The Bowl. Seeing the girl force her way up in obvious pain, I decided I had to do the same. Each step felt like it might be my last. After a while, I was almost numb, almost indifferent to the struggle. As the top of the crest approached, the pain came back. I felt delirious. I stumbled several steps on a much flatter surface and collapsed onto my left side in the snow. My right arm covered my face. I felt my lungs expanding and deflating as I sucked in oxygen. I had used up so much energy that I whimpered to myself. I felt beat. Destroyed. Annihilated. At that point, the mountain had won. A couple minutes later a man walked by and asked me something, but I couldn’t make out his words. I told him I was fine and leaned up. I sat there for a while. I stood up and took some photos and continued on. It turned out to be a great day. It was cold enough for good powder, but not too cold. Behind the large clouds were spots of blue sky. And the sun had poked its head out, beaming rays down on the bright white snow. I told him it was me, but in justifying the situation, I told him I hadn’t gotten much sleep the night before. He said he never does The Bowl without a good night’s rest. I understood that by then. But it was too late. I was too close to the top. It had two arrows pointing in different directions with “BOYS” and “GIRLS” under the respective arrow. One man took the advice of the sign while I took photos of the snowy valleys and peaks in all directions. I had a man take two photos of me, too. By then, I didn’t seem too worried. Maybe it was because everyone around me seemed in such a good and relaxed mood. Maybe it was because I saw women skiing down The Bowl. Maybe the beautiful scenery put my mind at ease. Maybe I used up all my energy on the ascent and had no more energy to waste on worrying. It probably was a bit of each. I sat down for a while and then put on my skis. I skied to the edge and asked another guy where the best part was to ski down. He said it was his first time down The Bowl. I told him it was my first time as well. I waited for about half a minute and then decided just to live by Matt Foley’s (Chris Farley in Saturday Night Live) motivational speech titled, “Go For It.” So I slid over the middle crest and away I went. My skis sunk into the deep powder and after a turn or two, every bit of negative or anxious thought disappeared. I was free. I was doing The Bowl. It felt like a longer version of the Head Wall at Snowmass Mountain. Each turn was easy to make because of the foot-deep powder. However, I had to ski more sideways than usual. Otherwise, I’d be flying down the slope and a wipeout would be imminent. I skied to the bottom without a fall, but not skiing it as aggressively as some other people. I met the snowboarder who had nailed me with snow. He told me he works at The Little Nell and I told him I’d burn a CD and give it to him since we both work in town. I looked at The Bowl, still amazed at what I had just done but too tired to dwell on it. I continued skiing along the catwalk. I took one last stop and looked up at The Bowl. The fear, the anxiety and other thoughts that had gone through my head just an hour and a half ago were gone. I had done it. Now all I needed was some sleep. Forget social security. I don’t need it. 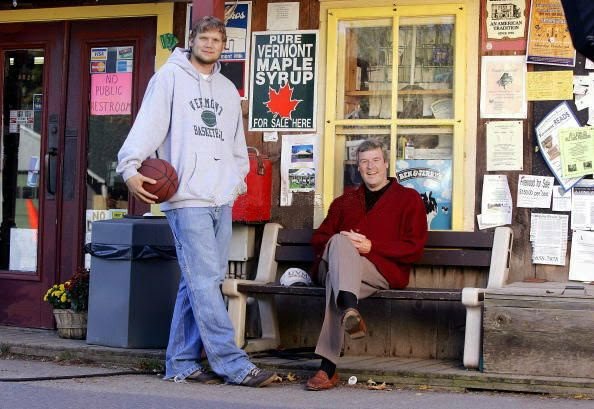 When I am old, the Vermont basketball teams of the late Brennan era will be my pension. Sure there will be other conference champions. Sure there will be other two-thousand point scorers. But there will never be another Taylor Coppenrath. There will never be such a venue as Patrick Gym. And most of all, there will never be another coach like Tom Brennan. That’s why in December I bought a plane ticket from Denver to Burlington for the America East championship weekend. If there was one game I couldn’t miss, it would be Vermont playing for the title on March 12. But deep down I had a good feeling. After all, this was a team that started four seniors and had won two consecutive conference titles. From a bar in Aspen, I had watched Vermont take No. 1-ranked Kansas to the wire on the road, losing its opening game in the closing seconds. In February, I saw the Cats on ESPN, falling to Nevada after leading for more than a half in Reno. And if they had spent a few less hours at the blackjack table in Las Vegas maybe they would have had their legs down the stretch. But isn’t carpediem what Brennan and his players symbolize? Isn’t it better to have fun and leave everything on the court? Isn’t that what college sports are about? Would you expect anything different from a team whose coach ends each of his morning radio shows, “Yesterday’s history, tomorrow’s a mystery, today’s a gift, that’s why we call it the present. So tear into it like a 5 year old on Christmas.”? How could you not love a man who takes his team out to the finest steakhouses in town on road games? How could you not love a man who cheers for his team like a fan when they’re doing well and lets his assistant Jesse Agel worry about the X’s and O’s? Unless you’re a NBA prospect when you enter college, is there any other coach or program you’d rather play for? In February 1996, moments after his final home game in a Vermont uniform, guard Bernie Cieplicki told me there was no better coach to play for than Brennan. That day was the first time I saw UVM play. Now, the first thing Brennan says to me is, “My boy!” Every time I’m around him I feel important and most of all, I laugh. I remember trying out for the UVM basketball team my freshman year. After lasting three days he cut me and the other walk-on hopefuls. If it were any other coach I would have been upset. But I knew he made the right decision, and I then knew what Bernie Cieplicki had meant. Tryouts were fun, and when Brennan wasn’t instructing or making a point, he was cracking jokes. So now it’s March 2005 and UVM has won every home game of the season in front of a sold-out crowd. And the whole state of Vermont and a young man in a small Colorado town are pulling for one more home game. But first they must win at Binghamton…. I only had two connections to the games at Binghamton – the live play-by-play from Chris Wojcik on my computer, and the Lands, who gave me a call before, during and after the UVM games to relay the various facial expressions and crowd noise. It was a nervous and exciting feeling listening to the games more than a thousand miles away. The anticipation of every basket was more intense than being at the games because I had no control of the outcome. No yelling at the referees. No friendly gestures to the players. It was all in their hands. But I knew the Land crew would cheer in place of me, along with lots of other Vermont fans who made the six-hour drive to the Events Center near Binghamton on Saturday, March 5 to see UVM play UMBC. Game time. Taylor was fouled down low and scored the first two Vermont points at the foul line. Vermont’s next basket was a straightaway three-pointer by Sorrentine. They continued this trend for the rest of the weekend. Agel’s days were limited as well since he wasn’t named Brennan’s successor despite having been his assistant for 17 years and maintaining strong support from the team and community. For Senior Night, on Feb. 24 against UMBC, all the Vermont players wrote “Agel” and “17” on their sneakers. Against Binghamton in the semifinals, Vermont continued to play inspired basketball despite the vociferous Bearcat fans. Sorrentine got UVM off to a fast start, but Binghamton was shooting well also. I listened to every possession like a Catholic listens to the Pope. And maybe, I thought, if I listened well enough and prayed, Burlington would be my holy land the following weekend. As Vermont went on a run before halftime, I could hear fans chanting “UVM, UVM!” The Cats led 41-33 at intermission. I felt better. Vermont’s only loss when leading at halftime all season was at Nevada. With 4:07 left, Binghamton had cut Vermont’s lead to ten (68-58). At that time, the scorer’s horn would not turn off and the game was delayed for ten minutes. When play resumed, the momentum had changed in UVM’s favor. Moments later Binghamton’s main offensive threat, Alex Adediran, fouled out on a dumb foul with Vermont’s lead at nine points. Binghamton never recovered. Final score: Vermont 76 Binghamton 65. With his 262 career victory, Brennan became the all-time winningest UVM coach, passing John “Fuzzy” Evans. Coppenrath had 34 points and 12 rebounds, scoring most of his points near the basket or at the foul line like he did against UMBC. Sorrentine finished with 25 points. Taylor and T.J. combined for 112 points in the two games. Even more remarkable was the fact they both were not at a hundred percent before the playoffs. Coppenrath was still fighting the effects of the flu, and Sorrentine had practiced only once in more than a week due to a tender right hamstring that he had injured in the second half on Senior Night. While they may not have played at full strength, they played with full confidence. What happens when that swagger returns to Burlington? I couldn’t wait. “Coming back home is going to be great,” David Hehn told reporters. “I’ve been telling ... (the freshmen) that they’re in for the best week of their lives.” For me, it was a week of anticipation and trouble sleeping. Buzz and Donna did not know I was coming to Burlington. Maybe it was surprising them. Maybe it was seeing the last home game of an era like no other. Maybe it was knowing I’d be waking up at 2 a.m. and driving to Denver, flying to La Guardia and then to Burlington. Whatever it was, I couldn’t sleep. The whole week before I was restless and now it was damn near impossible to think about anything else. I kept closing my eyes and then opening them and staring at the red numbers on my alarm clock…7:15…7:27…7:33…. Time crawled by. I must have fallen asleep around midnight or so. I woke up just after two with a headache, and I felt cold and groggy. A few Motrin and a shower and I was on the road -- alone and in the dark. Waiting in the airport terminals and on my flights, I mostly slept or just closed my eyes. When trying to read a book I had brought, I had trouble keeping my mind on the words. Finally I landed in Burlington on a cold, snowy night. Peter drove me to Rabbit Road in his old white Volvo. Before he drove up the Land’s driveway, he let me off, so I could walk through the woods and sneak through the sliding glass bedroom door that he had left open for me. After tromping through the deep snow, I hid in Buzz’s closet. Donna was talking to a friend on the phone about how difficult it was to get a ticket for the next morning’s title game. Minutes later I heard Buzz arrive. I nonchalantly walked through the pantry and into the living room. As I made my way into the dining room, Donna looked at me, and said, “Mr. B?” Buzz was on the phone and turned and looked. Even though Buzz claimed that he knew I was coming, it was worth the surprise. The next morning, Peter drove me from his apartment to the Burlington Country Club parking lot. It had snowed during the night. We were by ourselves waiting for the Lands and friends, so we took some pictures as it continued to snow. The Lands arrived and we walked toward Patrick Gym. And oh, how things had changed. Even since the previous year. I didn’t remember fans holding up signs that said, “I need a ticket.” I had heard someone sold four tickets for more than $800 on eBay. I didn’t remember a stand outside the gym lobby giving out free pieces of pizza and hotdogs. But my empty stomach was pleasantly surprised. And I didn’t remember a pair of arcade-style basketball hoops outside. Whoever made the most shots in thirty seconds won a game-worn UVM jersey. Peter and I were past our prime. Of course some things hadn’t changed. There were gravy fries and a long line for a cup of Ben & Jerry’s. I walked past a Vermont fan in a gorilla suit and inside the gym lobby, where most people wore green and yellow outfits. On the balcony I noticed Eddie Benton and a few other former players and assistant coaches. Boy, time flies, I thought. Last time I saw Benton, he was playing in a UVM uniform. Now his sweater covered a stomach that hadn’t missed a meal. I walked outside and talked with Peter about how Vermont would contain Northeastern’s point guard Jose Juan Barea. At a quarter of ten, I saw everyone facing Harris Hall. But it wasn’t the dorm they were watching. It was Brennan, wearing a tan overcoat and a big smile. As he strode by me and the other fans, who were cheering for him, I thought of a moment during a game back in 1970 between Georgia and LSU. Brennan was guarding “Pistol” Pete Maravich, who pushed off while driving to the basket. But Brennan was whistled for the foul. Brennan told the referee it was an offensive foul. The referee turned and said, “Hey, they ain’t here to see you!” But on this cold and overcast Vermont morning, they had come to see Brennan. By ten o’clock, the will-call office opened, so I decided I should get my ticket that Reza had reserved. As soon as I got in line, George Coppenrath and one of his sons waited behind me. I told him it would be an emotional game but the last regular season home game should help the team deal with that type of feeling. “Now I know it’s their last home game,” he said. Why was I the one convincing George that UVM would perform well? Wasn’t he the one with the son who was named conference Player of the Year three straight years, joining the late great Reggie Lewis? Didn’t his son score 43 points in last year’s title game with a recovering broken wrist? Wasn’t his son the second-leading scorer in the nation? Maybe it did make sense to worry. Maybe it was very difficult to beat a team like Northeastern three times in a row. Maybe the expectations had grown too high. Still, I wasn’t worried. I left that up to Taylor’s father. With my ticket in hand, I walked behind the UVM bench and directly up the aisle to my seat, which was in the corner and up high (row Z). It didn’t matter. There are no bad seats in Patrick Gym. The environment had changed since I saw Vermont beat Maine a year prior. Behind me on the wall, and on the opposite side, it said in white letters, “WELCOME TO CATAMOUNT COUNTRY.” The UVM student section looked like it had doubled in size, occupying close to half of the bleachers on the other side adjacent to me. The Husky fans stood out with their matching red T-shirts behind their team’s bench and a smaller group on the opposite side up high. UVM fans booed when the Northeastern players jogged onto the court in their black uniforms, and cheered louder than they had booed when Vermont ran out in its white uniforms. Looking across at the bleachers, I saw Peter in his yellow UVM sweatshirt. He spotted me and smiled and waved. A man near Peter held a yellow sign above his head that said, “TAYLOR’S HOUSE.” Next to the Vermont bench the cheerleaders wore black uniforms with green bows in their hair. Northeastern had cheerleaders too. Across from the UVM bench, in the corner, the Catamount pep band played. The only band I remembered was a couple of elementary school kids and a middle-aged woman and an old man who damaged eardrums at hockey games. Now, Vermont had a legitimate pep band, and at basketball games. Oh, had things changed. I found out after the game that Vermont fans had watched the game on a large screen on the nearby indoor tennis courts, where they had the post-game reception a year earlier. There was half an hour until tipoff and Vermont and Northeastern fans were chanting back and forth as if in a cheering contest. First, “UVM, UVM!” Then, “Let’s Go Huskies!” I noticed former Duke point guard Jason Williams was one of the ESPN announcers. In front of me, Germain Mopa Njila’s friend Georges, who was also from Cameroon but played for New Hampshire, sat. “Do you think UVM will make it to the big dance regardless of whether they win or lose?” I asked him. Could it end any other way in Brennan’s last home game? After a week of sleepless nights, it was game time. Taylor won the tip and T.J. dribbled up. Twenty seconds later Martin Klimes threw an overhead pass from the top of the key to Taylor, who had sealed his man and banked it in. On Northeastern’s first possession, Taylor knocked the ball loose from Bennet Davis. There was a scramble in the paint. Bodies were on the floor. I couldn’t see what happened because a couple of fans stood and blocked my view. I saw T.J. push Barea away from the pile and say a few words at him as referees separated the two point guards. Later, as I watched the play over and over on video, I saw Klimes on the bottom of the pile with the ball. Barea had jumped in and threw two left-handed punches at Klimes, hitting him in the face. Jason Williams said that Barea should have been ejected. One fan held a sign that said, “No Way Jose.” The two referees watching the play again and again on a courtside video monitor, thought differently. They called the two coaches to halfcourt and issued a warning to both teams. Brennan, wearing a tan suit and purple shirt and pink tie, knew it was B.S., but didn’t argue. I, on the other hand, booed as loud as I could even though I didn’t know what had really happened at the time. I knew if I had flown that far, I was going to make as much noise as possible. When play resumed Klimes was on the receiving end of Taylor’s bounce pass, fumbling it and then taking a drop step and making a layup to put UVM up 4-2. Vermont led the rest of the way. Barea dribbled slowly up the court on the next play and Vermont fans cheered loud. Sorrentine scored the next UVM basket on a fadeway three in Barea’s face. After that shot any doubt that was in my bones, no longer existed. Just before the midway point in the first half, Germain was on a one-man fastbreak, scoring against two players and then sinking a three-pointer from the wing. On the next basket, he penetrated and dished to Taylor for a layup and a 23-11 lead. A few minutes later Taylor scored down low and one guy near me said, “You can’t stop him.” A guy next to him said, “Blow them out.” It was starting to seem that way. “Yeah,” I said. “He’s on a mission.” I hadn’t seen him smile once. Vermont led 48-34 at intermission. The first half felt like it flew by, perhaps because Vermont played so well. As a UVM fan in the lobby remarked to another fan at halftime, “It’s too good to be true.” It was for Klimes, whose good fortune came as a result of the attention Taylor, knee socks and shaggy hair, drew from the Husky defense. Klimes had a career-high 15 points, scoring all 15 in the first half. He didn’t miss a shot, converting seven field goals and a foul shot. The second half was no better for Northeastern. Any hope of a comeback diminished when Barea left the game with a sprained right ankle after landing on Taylor’s sneaker on a double-pump layup attempt at 13:58. I felt bad for Barea. 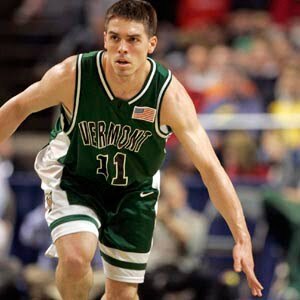 I also wanted UVM to beat Northeastern with the Husky’s best player in the game. But it didn’t matter. Vermont led 62-40. In the second half Northeastern adjusted, playing Vermont straight up and trying to double Taylor only when he had the ball. There was no defense for UVM on that day. During a 14-minute stretch Taylor scored 21 straight UVM points. Either way, Vermont’s experience and talent helped them live up to the slogan “You Can’t Stop Us!” on the white T-shirts that were handed out to the fans before the game. When Brennan substituted Klimes out with four minutes left, they both gave each other a big smile and hug. Moments later, I saw T.J. standing in the corner before the ball was inbounded and for the first time he was smiling. Then the cheers began. Fans began chanting, “Thank You, Brennan!” They repeated this cheer for Taylor, then Agel and then T.J. I walked down the aisle with a few minutes left, and stood behind the UVM bench. Alex Jensen was taken out of the game and greeted his excited teammates. Taylor did something I never saw him do after Jensen passed him. He started jumping up and down, doing a dance by himself. “That’s right, dance big man,” said a young man next to me. “That’s right, do your dance.” Some of the UVM players wore white America East championship T-shirts and tan championship hats during the closing seconds. Vermont had won big: 80-57. I rushed the court with the team, jumping up and down. Seconds later, I felt a hand on my shoulder. It was Buzz! We jumped up and down for a while. Once again, a year later, and it didn’t get any better than that. We finally found Peter and Dave and Germain, who made the all-tournament team along with Klimes, T.J. and of course, Taylor. Germain finished with nine points, nine rebounds, seven assists and three steals while shutting down one of the conference’s top scorers, guard Marcus Barnes. Taylor was named MVP and finished with 37 points. The same Taylor I talked to last May in Burlington, with neither of us mentioning basketball. The same Taylor who told me how he had been tutoring kids at Colchester High and his interest in becoming a math teacher after graduation. You needed a calculator to add up his stats. And to think three summers ago we were playing beer-pong together. Or the hot summer day he drove a friend and me in an old, small sedan to go cliff jumping about 45 minutes south of Burlington. And we jumped off the 30-foot cliff after walking across a narrow and slippery ledge to the jumping area. Good thing Brennan never knew about that. But, we didn’t know Taylor would be named the best conference player that upcoming season. We only knew he was a fun guy to be around with a friendly demeanor. Since then, nothing has changed. 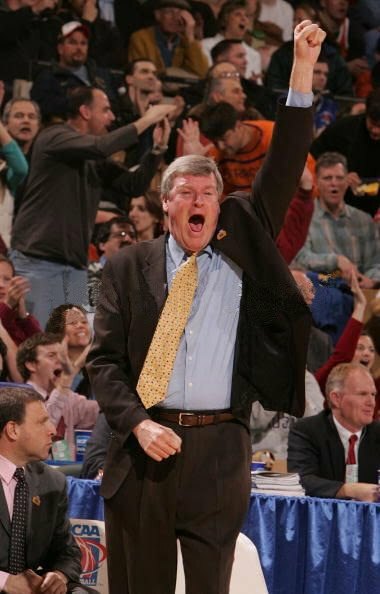 Except for his opportunities as was heard after Taylor had cut the net and walked down the ladder with fans chanting, “NBA, NBA!” I felt a chill down my back with Buzz and Peter standing next to me. We were all sweating. When Brennan cut the net, the fans repeated their chant, “Thank You, Brennan!” He cried. We hung around and took photos with friends and fans. “How good are you?” said a middle-aged woman to Germain as she reached up and grabbed his face with two hands. Germain smiled. Taylor posed for pictures with four girls who had his mug shot on the back of their white tank tops and the words “Taylor Got Back” on the rear of their green skirts. There also was a toddler on Taylor’s left shoulder and two small girls with homemade yellow “VERMONT 22” T-shirts in the shot. When there was just myself and a few players and parents left in the gym, I left with Reza and Germain and Georges. Reza drove to Shanty on the Shore and we ate lunch and talked about the game. It was so quiet and unassuming in the restaurant next to Lake Champlain. Patrick Gym seemed like a different world in comparison. By the time it was announced on Selection Sunday that Vermont would play Syracuse, I was hoarse. But I still tried to talk to the Lands about the upcoming Friday game in Worcester, Mass. My first thought was, oh no, Syracuse is a surging team. But on second thought, I knew Syracuse head coach Jim Boeheim’s teams never were very disciplined and often had poor shot selection. Besides, Vermont had experience in the tournament. They were more ready now than ever before. That was the feeling I carried with me all week. “Actually the only tape I see after a game is whatever highlights come on the TV set in the bar I’m in,” Brennan said. The only bad part of an exciting week leading up to the weekend in Worcester was the lack of tickets distributed to UVM fans. However, Buzz, Donna and Peter had tickets, so I was happy. Since I don’t have even basic cable television, I watched the game at a friend’s place in my apartment complex. My friend had left for the weekend so it was just the couch and March Madness and me in a small room. By gametime, my only fear was a bad start for Vermont. I knew if they made a few shots early in the game they’d settle in. Hakim Warrick tipped the ball to Germain and both teams missed their first few shots. Syracuse was in its patented two-three zone. Klimes flashed to the foul line and received the ball and split the zone with a quick bounce pass to Taylor for a layup and the first two points of the game. A minute later, Germain tipped in a miss for a 4-2 UVM lead. Vermont led 8-4 when Taylor scored over Terrence Roberts while falling back and leaning with one second left on the shot clock. Then at the 12:50 mark, CBS switched to the Duke-Delaware State game. The good feeling I had about Vermont stayed with me as I watched the updated score on the ticker. When they switched back to the game, it was the beginning of the second half. As if on cue, UVM went on a run and gained a 30-27 lead. First, Taylor scored an old-fashioned three-pointer on a reverse layup and foul shot. Then T.J. and Germain each made a contested NBA three-pointer from the wing and the fans, who it seemed were mostly rooting for Vermont by then, rose to their feet and cheered. Unfortunately, CBS switched the game and when it returned at the 6:24 mark, UVM led 38-36. Because Vermont had slowed down the game, I knew it would likely remain close and low-scoring. And as if on cue again, T.J. made a NBA three-pointer and a minute later Germain stole the ball and was alone on a fastbreak. I thought to myself, just make the dunk Germain, just make it. Instead, he double-pumped in the air and slammed it with two hands. UVM led 45-41. I jumped up and down and yelled in the room by myself. As time slipped under two minutes, Vermont trailed by two. But if there was a savior on that day, Mopa was his name. Germain split a double team at the top of the key and made a leaner to even the score. I thought, how did he make that? Taylor’s jump shot and Warrick’s offensive foul on an elbow to Klimes’s face sent the game into overtime, even though Germain scored on a drive with 3.7 seconds left. Unfortunately his left foot was on the baseline. It wasn’t just an upset in the making, it was turning into an instant classic. My brother called me and said he couldn’t believe the score. “I told you Vermont’s a very good team,” I said. “I guess so,” he said. Before the overtime, the cameraman zoomed in on the UVM huddle. Germain was smiling. He had good reason to smile. Klimes made a 10-foot jumper for the first overtime points. But the two biggest shots were yet to come. With UVM down two, and two minutes left, Germain made a three-pointer on the wing. That shot erased my worry. On the next Vermont possession and still a 56-55 UVM advantage, Brennan was shouting at Sorrentine to “run red,” which would have him slice through the Orangeman zone and look for Coppenrath for a shot. But sometimes playing on instinct is best, which no one consistently epitomizes on the UVM team more than Sorrentine. So he shook his head no and said, “It’s okay, Coach. I got it.” There was just a little over a minute remaining. The shot clock was winding down. He took a few dribbles, bent at his knees five feet behind the NBA three-point line and let the ball go. Swish! I screamed with joy and was jumping around the small room again. Vermont did it. They beat Syracuse 60-57. Brennan pumped his fists toward the crowd as he left the court. Brennan was right. No drug or stimulus could do what he and his group of young men did. I wasn’t the only one who was glad Brennan had lied. I called Peter and relived the highlights. Then I watched ESPN that night over and over. At last, basketball fans across the nation could see and hear what UVM fans had been blessed with for years. Players and fans were talking about UVM advancing to the Sweet 16 and further. And why doubt Vermont? Oh, had things changed. When I called Peter, he told me he saw Germain coming out of the locker room. “Guess what Germain is doing?” Peter said. “That’s right. He’s got a big smile as if they won and are going to the Sweet 16. 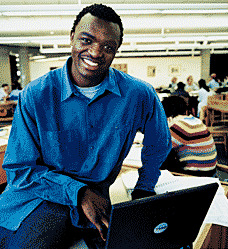 When I talked to Germain on the phone on Monday, he said he was tired, but he was studying for a religion exam he had to make up that afternoon. Would any other player who just had the game of his life and helped make school history by winning its first tournament game over a Big East power be studying when he got back? During spring break, nonetheless? Maybe only then. Maybe only in Burlington. I was wrong. The Brennan era isn’t my social security because it would then require a dollar amount. The Brennan era is priceless.